January 28, 2019 | Hamden, CT – Vanessa Research, Inc. (VRI) is pleased to announce that its MIDA™ (Microvillus Inclusion Disease Assay) project, under the direction of Dr. Ludmila Kvochina, has been accepted into the 2019 cohort of the highly selective Accelerator for Biosciences in Connecticut (ABCT). MIDA™ is the first-ever dipstick test developed to screen for the incredibly rare and lethal microvillus inclusion disease. 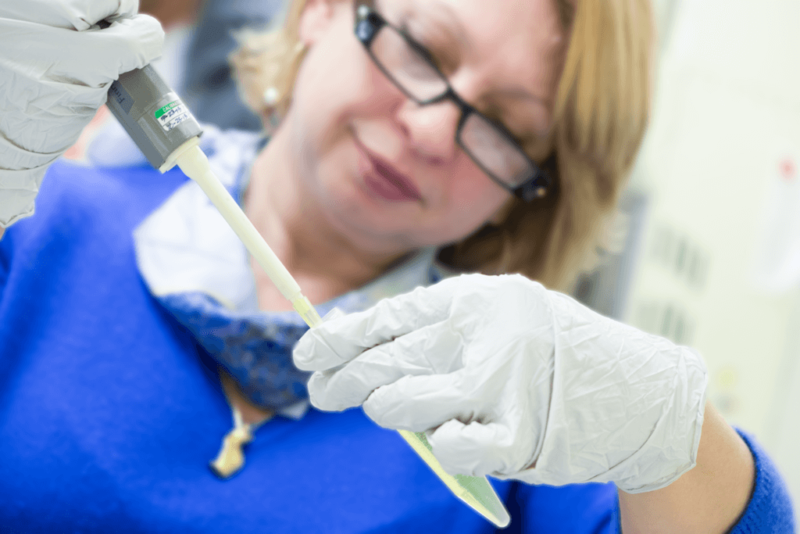 Dr. Ludmila I. Kvochina, Director of Research & Development Laboratory at Vanessa Research, has been working to develop a high throughput screening test for detection of microvillus inclusion disease in infants presenting with diarrhea. ABCT’s competitive-entry six-month-long program helps emerging bioscience ventures grow by providing entrepreneurship education and business networking to access global funders and prospective team members. ABCT’s goal is to support the development of Connecticut’s hub of bioscience innovation and commercialization. The MIDA™ project was selected following an extensive screening process that involved evaluation by expert scientists, active investors, and business strategists based on the strength of the team, uniqueness of insight, and capacity to revolutionize the life sciences industry. Microvillus Inclusion Disease (MVID) is a rare intestinal disorder presenting early in affected infants’ lives, with patients experiencing severe diarrhea that renders them unable to absorb fluids, nutrients, or electrolytes – meaning that malnutrition and dehydration are inevitable and often lethal if the condition is not appropriately recognized and treated. Many children affected by MVID may not live to see their third birthday. MVID is often misdiagnosed – or not diagnosed at all – due to a general lack of awareness of the disease. MIDA™ intends to bring MVID into the standard differential diagnosis for infants presenting with diarrhea; potentially aiding in raising general awareness of the disease among physicians and thus, decreasing rates of misdiagnosis, delayed diagnosis, or missed diagnosis of this rare genetic disorder. MIDA™ is being developed to accompany VRI’s company mission to “give hope where none existed” by filling the unmet need for a reliable and simple means to screen for microvillus inclusion disease. MIDA™ joins VRI’s expanding portfolio of products addressing diarrheal diseases, including Shylicine™, the first drug designed to treat MVID; and Hunazine™, a treatment that is being developed to neutralize the Cholera toxin in affected patients. While MIDA™ is new to the Accelerator for Biosciences in Connecticut program, Vanessa Research is not. The company’s SOLaware™ Display – a device that could be found informing beach and park visitors of local UV conditions and sun safety tips across CT last summer – was a participant in the ABCT’s inaugural 2018 cohort, and among the program’s first projects to generate customer revenue. Vanessa Research is based in Hamden, Connecticut, with offices in Farmington, Connecticut; London, England; Budapest, Hungary; and Navarre, Spain. VRI was founded on the desire to build a 21st Century, sustainable, innovative, entrepreneurial organization by bringing together a collection of diverse scientists, engineers, business professionals, and academics to create solutions in medicine. The company’s mission is to “give hope where none existed” by delivering healthcare products that improve and increase access to quality care while decreasing costs.